Historically Samoyeds were used by the Nomadic people to move large herds of reindeer, sometimes pull sleds, and keep the people warm at night in their huts. 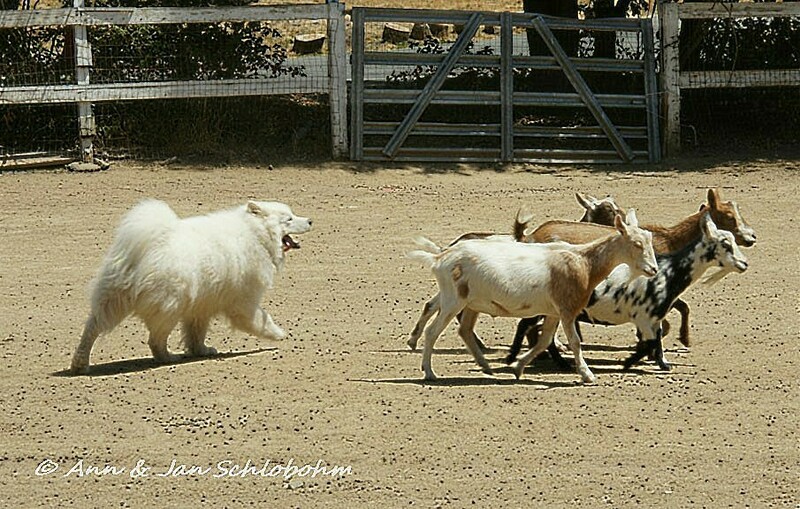 Today the Samoyed is still a very multi-functional dog, including herding. They are a loose-eyed breed, controlling stock with their body presence rather than the Border collie stare. In most ways they work like Collies or Australian Shepherds. The tend to be gentle with the stock, but do have a characteristic ‘body slam’ to move reluctant stock. They are normally close working and tend to prefer fetching to driving the stock. Some bark out of excitement, some bark to move stock, and there are some that work quietly. 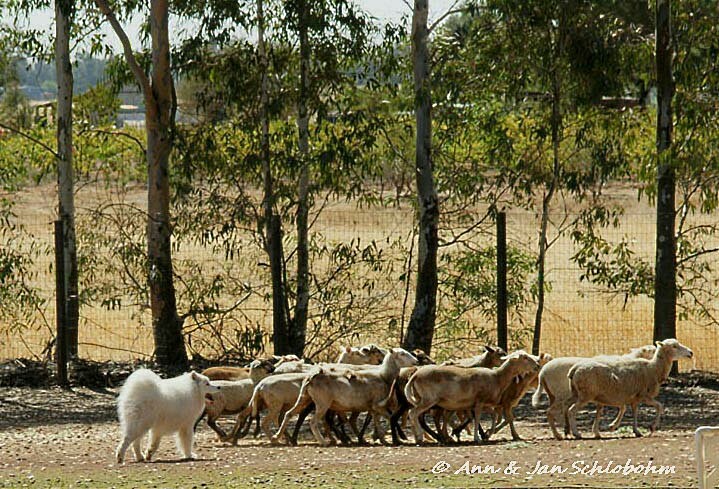 Although there is not a great number of Samoyed owners actually doing herding with their Samoyeds, those of us that do love the breed and appreciate the work they still have the instinct to do. At most of the National Specialties in the US, herding instinct testing is offered, and normally around 60-75% pass showing that the instinct is still in the breed. Personally we have done herding with our past two Samoyeds. Jake was the first we started and he lived to herd, and is currently the only one to have earned multiple Advanced titles and the Herding Championship in AHBA (American Herding Breed Association) and a High In Trial under French Judge Michel Pillard during a ‘French Herding’ trial put on in California. Bode also herds, but it is not his end-all. 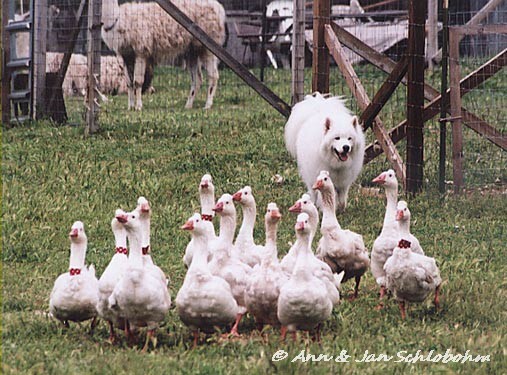 We have found that although Samoyeds can work all stock, sheep, goats, ducks, geese – they do have a preference for large flocks – probably dating back to their heritage of working 1000’s of reindeer. Ours have also preferred doing chores, working pens, and just being a stock dog to actually trailing. They want to have jobs to do. We’ve found that working with a breed not normally associated with herding is fun, challenging, rewarding and we wouldn’t do anything else. Thank you Ann & Jan Schlobohm which I received permission your text and the pictures on my web page to publish! es vorzuziehen, zum Bewegen der Herde einzelne Tiere herbei zu holen. Vielen Dank Ann & Jan Schlobohm, das ich die Erlaubnis erhielt den Text und die Bilder auf meiner Webseite zu veröffentlichen! Sowie Sabine van Wel für die Übersetzung des Textes!